Materials: Ultralight nylon ripstop with Pertex Quantum shell and PlumaFill synthetic insulation. Patagonia markets the Micro Puff as a competitor to down for weight and insulation, while providing water resistance. The company calls the PlumaFill synthetic insulation a revolutionary down alternative with the best warmth for weight of any jacket it offers. The shell is Pertex Quantum® ultralight nylon ripstop treated with a DWR (durable water repellent) finish. The temperature was 35. A light rain fell on this chill November day. And me? I stayed warm and dry inside the Micro Puff, hood over my head, as rain increasingly glistened on the glossy outer shell. Maybe not the smartest thing to do, but I wanted to see how the Micro Puff withstood the rain while hiking. It passed the test, and once out of the rain the Micro Puff dried within about two hours. Worn as an outer layer, the Micro Puff easily handles temperatures down to at least the mid-teens. Where the Micro Puff shines is its light weight and warmth. At 9.3 ounces, it’s lighter than most hooded down jackets. Patagonia has really stripped down this jacket to save weight: no drawstrings for the hood or at the waist; no chest pocket; the only accessories to the basic jacket are two zipper pockets outside and two deep, zipperless pockets inside. And it can take the cold. 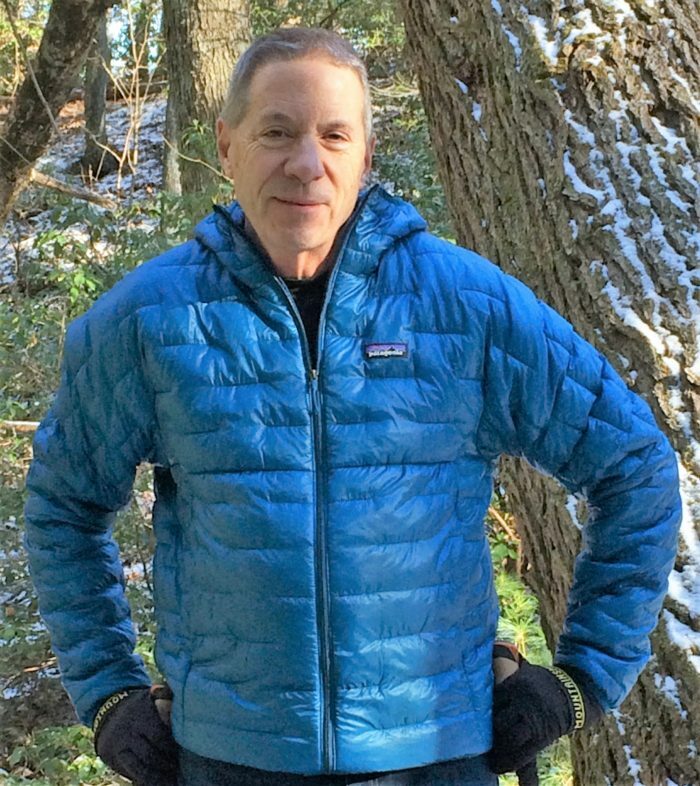 I hiked in temperatures down to 29, 22, and then 15, with lightweight and midweight long-sleeve shirts on underneath, and each time was proved wrong when I thought I was pushing the lower limit for this coat. Biting November winds didn’t pierce the Mico Puff’s exterior shell. Pull on the hood and you’re in your own microclimate. Be wary of wearing the Micro Puff as an underlayer, except perhaps in exteme cold. The Micro Puff is so warm that in temps around 30 I began heating up when wearing a thin outer layer, and moisture built up between the Micro Puff and the outer layer. 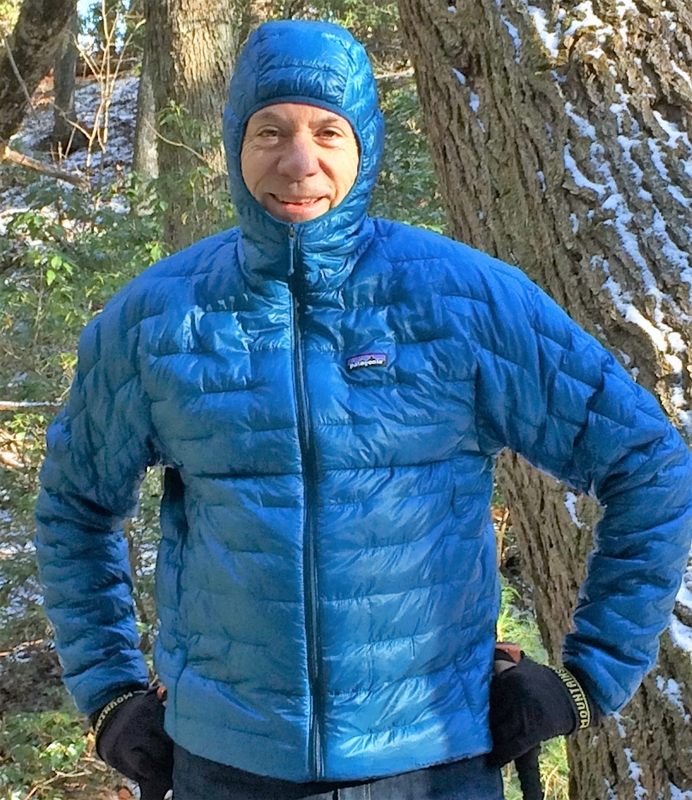 Because of that I preferred wearing the Micro Puff as an outer layer, and moved the zipper up and down for ventilation as my body heated up on uphills and cooled off in the shade and on downhills. Pull up the Micro Puff’s hood and you’re sealed off from the cold weather. The Micro Puff is pricey. But let’s face it. When your pack is overweight, the first pounds come easy. But when you’re crunching ounces, the gain doesn’t come cheap. So if you’re looking to put your base weight into Scrooge territory, the Micro Puff fits the bill. Comfort: The large Micro Puff fit me perfectly (five feet, ten inches, 170 pounds) with room for lightweight and midweight thermal shirts underneath. The jacket was so light I barely noticed I was wearing it. Packed: The Micro Puff stuffs into the outside left-hand pocket. Zip the pocket and attach it to your pack with the jacket’s carabiner loop. Or stuff it inside your pack so you don’t lose it. Hood: Fit snugly over my head; no drawstring. Pull the zipper all the way up and your head is firmly encased inside the hood, with room for a lightweight hat. Cuffs and hem: Elasticized to seal in the warmth, providing a snug fit that keeps the warmth in, the cold out. No drawstring for the hem but this wasn’t an issue for me as the elasticized hem fit snugly around my waist. Pockets: Two zipper pockets outside and two deep, zipperless pockets inside. Warmth: Versatile. As a single layer, wear it unzipped to about 50 degrees for light activity; zip it up and you’re good to around 30 for brisk hiking. Put layers underneath and you’re good down to the mid-teens (and maybe lower). Durability: After almost two months of nearly everyday hikes of two-plus miles I didn’t notice any wear or tear. But then again, I didn’t use the Micro Puff while rock climbing or bushwhacking. What I liked best: The Micro Puff’s versatility; wear it as an outer layer in temperatures down to the mid-teens, or as a single layer during warmer months. Corporate responsibility: Patagonia is committed to fair trade practices and environmental activism. Point of origin: Made in Vietnam. 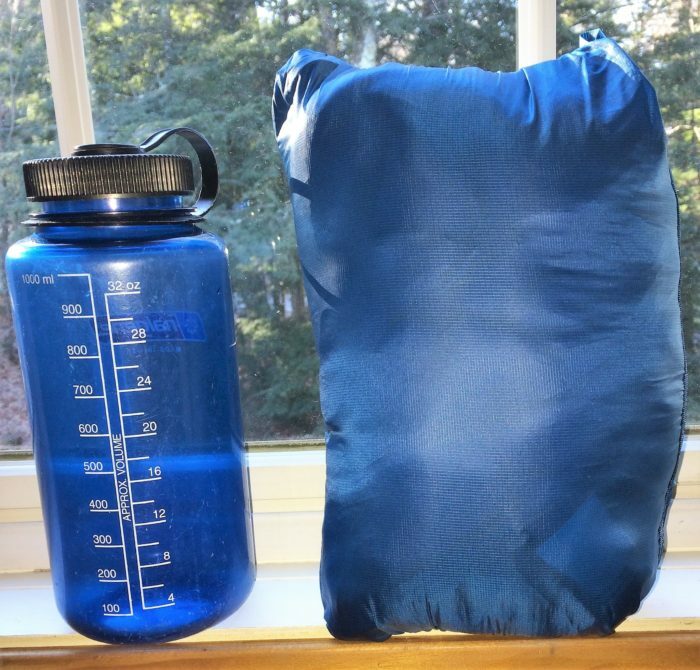 The Micro Puff, next to the ubiquitous Nalgene, packs into its outer pocket to fit neatly in your pack. Water repellent, to a point. How do I know? I wore it for nearly two hours in the rain. Washable. Patagonia puts washing instructions on a tag inside the coat, but I had to go to the company’s website to deciper the symbols. Longevity. Patagonia backs its products with its Ironclad Guarantee, which promises a return, repair, or replacement. Two outside zippered pockets, large enough to hold trail snacks, a map, or lightweight gloves. The hood, cuffs, and hem hug your body, sealing out the cold. Expensive. But for weight and warmth the price isn’t out of line with other coats in this category. And when you take into account that the Micro Puff has a hood, the weight-to-warmth savings seems even larger. The Patagonia Micro Puff is a warm, lightweight jacket that can handle the cold and wind down to about the mid-teens. The Micro Puff packs small, whether stuffed into the jacket pocket or inside a pack. And its resistance to water means you don’t have to throw on a raincoat at the slightest hint of rain. It’s already become my solid jacket for day hikes and backpacking.